Let’s hope that whatever your ailment is it can be taken care of by either aspirin, ammonia inhalants, or random white cloth. If not you’re out of luck. 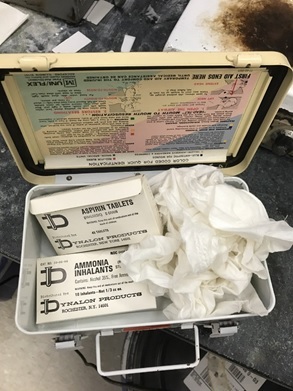 The laboratory worker who submitted this photo to Reddit had burned himself and when he opened the first aid kit this is what he found. The cloth might have been helpful to cover and protect the burn… except it’s definitely not sterile. First aid kits must be stocked with supplies that are appropriate for the potential hazards and types of injuries that could be reasonably expected to happen at a location. They must also be stocked according to any regulatory requirements or recommendations from consensus standards, such as ANSI. Your employer should be checking all first aid kits regularly and restocking as needed. If you see a first aid kit that needs restocking let your supervisor know right away.